Normal ramen from a packet. This is probably not the best photo, but ramen doesn’t have to be simply boring noodles! I like to cut up some combination of peppers, onions, mushrooms, broccoli, carrots, etc. For protein I often add some tofu (fried or raw) and in this picture I experimented with some dried soy balls from the asia market (cheap!). I’ve been really intimidated by the dry soy curls, cutlets, etc. but I realized using them is super simple. I just throw the raw vegetables, tofu, soy balls etc. in with the contents of the package and cover it with boiling water. Let it sit for 2 minutes and eat! Doesn’t take more than a few minutes, easy peasy! Just make sure the ramen you choose is vegan! I really like that clear veggie broth you get with vegetable soup from a Japanese restaurant, but could never figure out how to make something like that. I’ve tried with veggie bouillon, but always found the flavor too strong for this situation and it was the wrong color anyway. How do they do it, I wondered!??! I decided to try just using no bouillon. I put some water, chopped leeks, garlic, onions, carrots and broccoli in a pot, simmered for 10 minutes, added noodles, then added salt, garlic powder and soy sauce and topped it with scallions and fried seitan. This was good, but the vegetables were too soft from the simmering (duh). If you’re going to do it this way, I’d recommend saying veggie scraps in the freezer and using a couple handfuls to make a single serving of broth, then strain, add new vegetables and do it that way. You can also save your mushroom stems and make some easy mushroom broth! This way you get the fresh broth taste without the mushy veggies! Continuing my clear broth mission, we have the above result. While browsing one of the Asian markets in Berlin, I decided to peruse the bouillon cubes. Most were filled with meat and MSG, but, lo and behold, I found these! As you can see on the bottom, they say, “for vegetarian and diet”. The ingredients are simply: salt, sugar, fermented soy bean, mushroom flavor, black pepper, shortening and guar gum. I found a half a cube with about 2 cups of water made a broth that wasn’t too strong or salty. Cut all your vegetables first, as they don’t really need to cook that long and are not as tasty when they turn to mush! The bowl I’m eating as I write this contains chopped carrots, leeks, mushrooms, green peppers and broccoli. Topped with fried seitan and tofu and crispy fried onions, green onions and a splash of soy sauce. If I had Sriracha I’d definitely use that too. Put the bouillon and water in a pot, turn to medium-high heat and stir until the bouillon breaks up. Throw in the carrots, add the noodles of your choice. 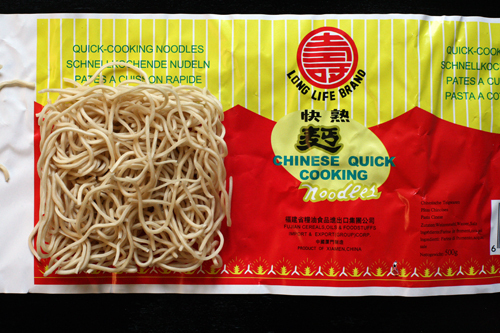 For a true ramen experience, I broke one square of Long Life Brand Quick Cooking noodles (image below) into the pot, but rice noodles would be good too, I’m sure. Immediately add the other vegetables, except peppers. Stir so noodles are covered. Let simmer for 1-2 minutes. Add the peppers, turn off eat and pour into a bowl. Top with your fried seitan, tofu, etc. Add the toppings of your choice. If I had cilantro it would have been on there! I love the Asian food market! Delicious! The last is definitely my favorite method when I have more than five minutes to spare and it takes only about 15 minutes in all! How do you eat your ramen? Any tips or tricks? Do YOU know how to make a good clear vegetable broth?! Thanks for posting this! I’ve been really obsessed with making my own ramen lately and trying to find the perfect broth for it. The asian market near me has provided quite a few inexpensive seaweed options for me to experiment with, and that has really changed everything! My favorite combo lately has been- about 6 cups of water, a 6 inch or so piece of kombu/kelp, 4-5 dried shiitake mushroom pieces(also super cheap from the asian market)-or you can use fresh. Over a low heat bring it to a simmer-not boiling for about 10-15 minutes. Strain out and discard the seaweed and mushrooms and stir in a few shakes of soy sauce or a spoonful of miso paste to add some saltiness. @matthew Thanks for the input! I’ll have to try your method! I haven’t been brave enough yet to play around with seaweed, but it’s totally worth a go! Good idea!